← Sopa Azteca, Skip the Chicken, Add Black Beans & Corn! Yummy Strawberry & Kale Salad w/ Sesame Balsamic Dressing! The cool thing about this strawberry and kale salad is that it doesn’t get soggy so you can have leftovers the next day! This made about 3 medium sized salads. Rub the dressing into the kale and let sit while you prepare the other ingredients. This will help the leaves soften up a bit. If the onions are spicy, put them in cold water while you finish the other steps them drain. This will lessen the bite. Toast the slice almonds being careful not to burn. I usually set a timer to peep after every minute to remind me to stir. This trick has totally saved so many nuts! 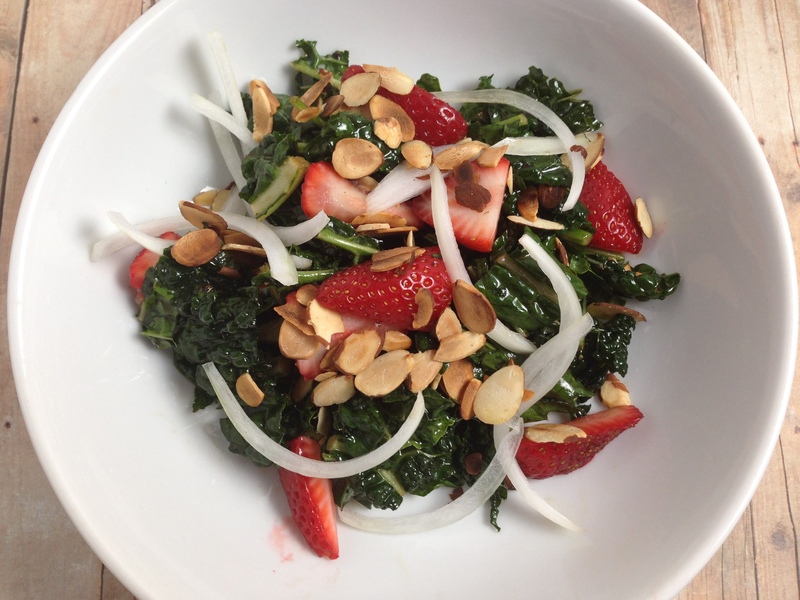 Throw the onions, almonds and strawberries into the kale and toss.